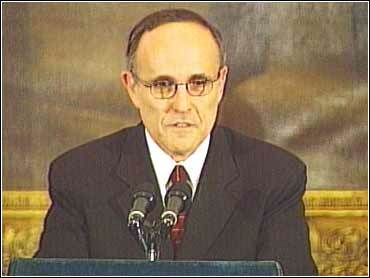 New York Mayor Rudolph Giuliani's girlfriend is now persona non grata at Gracie Mansion. A state judge sided with mayor's estranged wife, Donna Hanover, Monday, barring Judith Nathan from the city's official mayoral residence. State Supreme Court Justice Judith Gische granted Hanover's request for a restraining order barring Judith Nathan from the home. Gische ruled that Nathan could not enter the Upper East Side mansion or its surrounding grounds while the Giuliani children continue to live there as a family. Hanover, 51, and Giuliani, 56 continue to reside at Gracie Mansion with their two children, Andrew, 15 and Caroline, 11. Hanover sleeps in the master bedroom while Giuliani sleeps in a guest room. Giuliani had argued that parts of the 200-year-old four-story house were public and that Nathan should have been able to attend functions there. Hanover maintained it was a private home. The judge also tossed out the mayor's second attempt to obtain a gag order in the increasingly acrimonious divorce case.